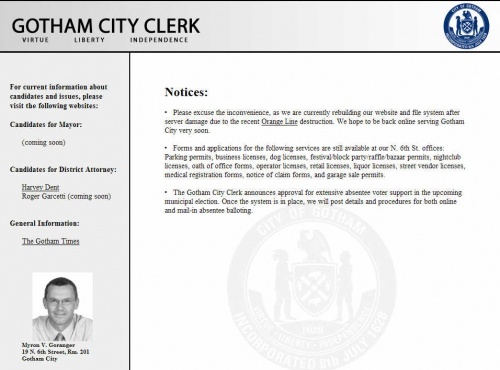 From the Gotham City voter registration card, Gothamcityclerk.com was found. It is a voting information website, which will presumably be updated with more information as the elections in June approach. • Please excuse the inconvenience, as we are currently rebuilding our website and file system after server damage due to the recent Orange Line destruction. We hope to be back online serving Gotham City very soon. • Forms and applications for the following services are still available at our N. 6th St. offices: Parking permits, business licenses, dog licenses, festival/block party/raffle/bazaar permits, nightclub licenses, oath of office forms, operator licenses, retail licenses, liquor licenses, street vendor licenses, medical registration forms, notice of claim forms, and garage sale permits. • The Gotham City Clerk announces approval for extensive absentee voter support in the upcoming municipal election. Once the system is in place, we will post details and procedures for both online and mail-in absentee balloting. Gothamcityclerk.com is updated with links to Danaworthington.com and Trustgarcetti.com, confirming their participation in the race for Gotham DA. 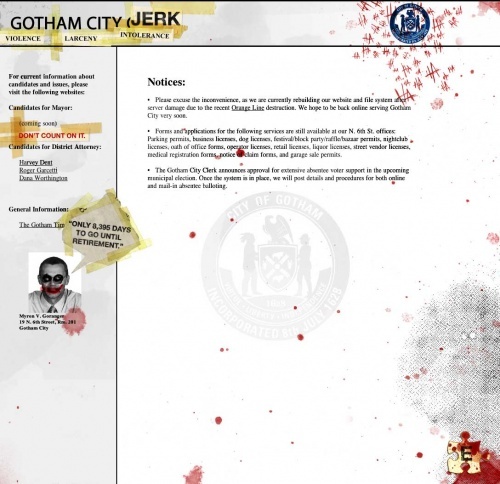 After the end of the countdown on Whysoserious.com/Overture, Gothamcityclerk.com was "Jokerized." This page was last modified 18:03, 11 July 2008.